When it comes to choosing a diamond for a piece of jewellery, the first decision you’ll need to make is its shape. The shape of a diamond means more than simply the outline shape of the stone. 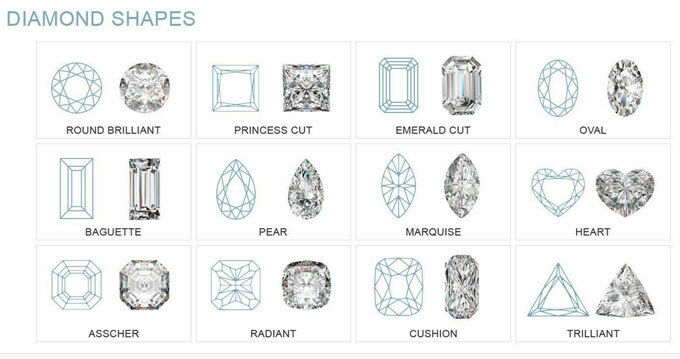 Each cut has a totally different number, shape and positioning of facets. These variations can have a real impact on sparkle and how visible any imperfections are. There is a rising trend toward fancy shapes in engagement rings, and below you will find a comprehensive guide on diamond shapes to help you select the perfect rock for you! Brilliant cut diamonds are often considered the most sparkly of the shapes and account for more than half of all diamond sales today. For any groom struggling to choose a surprise engagement ring, you’re unlikely to go wrong with a brilliant cut. They also make fantastic side stones or highlights in wedding or eternity bands and look great whether they are pavé, channel or grain set into the band. They have 58 facets in a pattern devised to exert maximum shine as the cut follows scientific theories of light reflection to optimise its fire and brilliance (hence the name). Natalie Portman wanted a ring that matched up to her stance on ethical issues so opted for an antique centre brilliant cut diamond, surrounded by dazzling pavé diamonds. 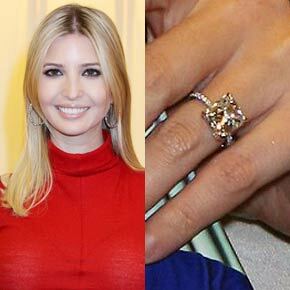 The diamonds are from conflict-free mine and set in recycled platinum. Princess cut diamonds are a popular choice for the contemporary bride because of the straight lines and crisp edges. The square shape looks fantastic as the centrepiece for a ring on long, elegant fingers. Square stones also work well on a smaller scale as accent stones because they work brilliantly in a channel setting, as the square shapes sit side by side leaving no gaps. The Princess cut is a modern design, devised in the 1970’s essentially as a modified brilliant diamond. With its pyramidal shape and bevelled shape, it creates the perfect conditions for light dispersion, making it a very popular choice for solitaire engagement rings and earrings. The Emerald cut was one of the first used in jewellery and so has a real classic look to it. With its simple geometry and stepped facet pattern, it has less fire than the brilliant or princess cuts but, therefore, has an understated grace about it. It is imperative to have a clear diamond with no visible inclusions in it for this cut to be successful as you can see so far into it. There are no fussy facet patterns to distract the eye from any marks or deposits in an emerald cut diamond. It is called an emerald cut because it was originally developed for the emerald stone to put it under less pressure during the cutting process. Oval cut diamonds are a fantastic choice for someone who loves the curves of a brilliant cut diamond but want something a little different. The oval shape works well to elongate shorter fingers and is rising in popularity as the central stone for engagement rings. The shape also optimises the carat weight of the stone, meaning that the drawn out, symmetrical shape can make it appear larger than a brilliant cut diamond of the same weight. The facet pattern and elongated shape can produce a ‘bow-tie’shaped shadow in the stone. This effect is reduced if the stones measurement ratio is more on the round side rather than long and slim. A skilled stone cutter can also make the stone a little deeper than normal or by altering the angles of the facets on the table of the stone. 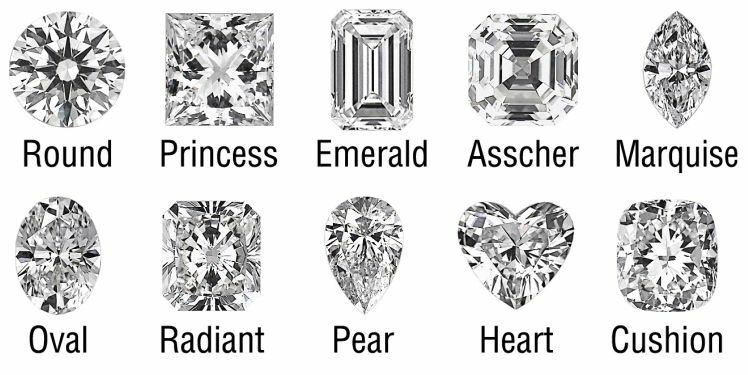 This is an issue for other similar long stones such as the pear, oval, marquise and heart shaped stones. 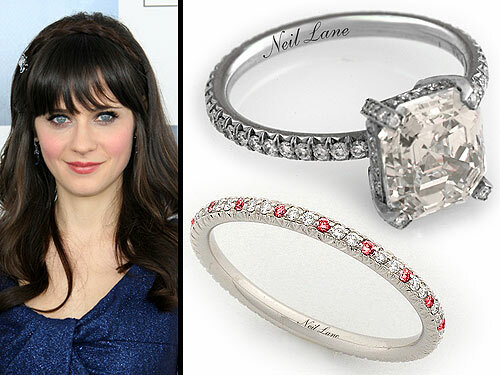 The Baguette cut is usually reserved for accent stones, often next to other rectangular stones such as the Emerald cut. Tapered baguette stones work really well in fan shaped designs; both of these styles achieve a real Art Deco feel. Tapered baguette stones also work beautifully as horizontal accent stones, leading the eye away from the centre stone and along the band. They only have 14 facets which gives them a lovely lustre but not a lot of fire. 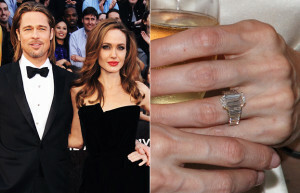 Angelina Jolie’s ring has a custom cut diamond in the centre with baguette accent stones either side. Pear or Teardrop cut diamonds make for a dramatic centrepiece in a ring and an elegant shape for a drop earring. The pear cut is an interesting cross between the brilliant cut and the marquise shape and works well in designs inspired by flames, droplets of water or leaves in organic pieces. 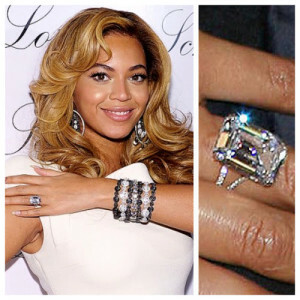 The shape works to elongate shorter fingers as with the other longer shapes such as oval and emerald. Colour is key with this cut of diamond as the pointed side is much thinner than the rounded side. In order for the stone to have a consistent colour throughout its length, opt for a stone H in colour or higher. The Marquise cut can trace its history back to the height of the French monarchy. King Louis XV commissioned his jeweller to devise a diamond whose shape mirrored the smile of his beautiful mistress. It makes for a dramatic centrepiece to a ring, which, like the other longer shapes, creates a favourable illusion of elongating the finger. However, set horizontally across the finger, it can create a striking look because of its eye shape and pointed tips. Catherine’s engagement ring given to her by Michael Douglas is one of the most recognisable celebrity engagement rings ever due to its stunning horizontally set antique marquise cut diamond. Heart-shaped diamonds are the ultimate romantic cut. 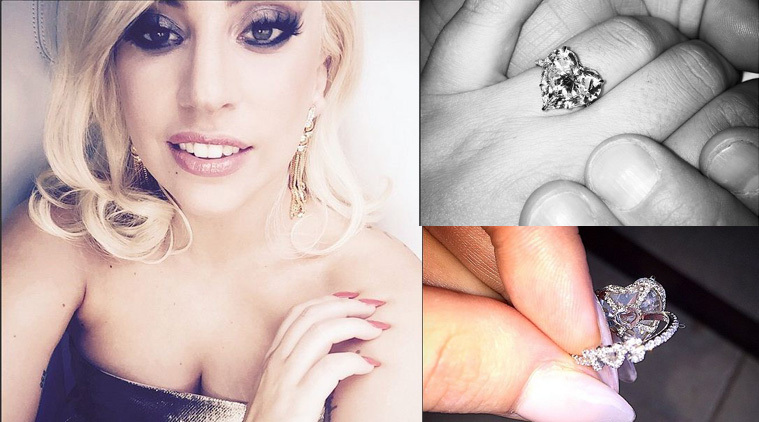 Lady Gaga has been given a heart shaped rock with a hidden design detail on the back of the ring – the lovebird’s initials interrupt the band behind the finger. Heart shaped diamonds are very similar to their brilliant cut counterparts in terms of mass. If you were to compare one of each side by side, each weighing the same, they would be very similar in size. Asscher Cut diamonds are essentially square versions of the emerald cut and have the same stepped, geometrical pattern of facets. This facet pattern creates an optical illusion a bit like a hall of mirrors and has a hypnotic, Art Deco look to it. 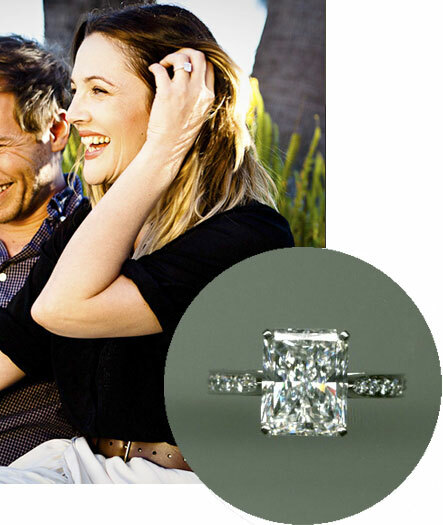 A well-cut Asscher cut stone has a tremendous lustre and they are increasing in popularity for striking engagement rings for the bride who wants to stand out. The Radiant cut has more facets than most cuts – it is a hybrid of the brilliant and stepped cuts and, therefore, has a wonderful balance of depth and sparkle. It has the most brilliance of all the square and rectangular stones and hide inclusions more effectively than other shapes, making it a perfect choice for someone who wants it all! Cushion cut stones are a lovely compromise between round and square; they resemble a soft cushion with their gently curving sides. There are many variations on the cushion cut: modified cushions have more facets in the bottom of the stone, which gives them a ‘crushed ice’ appearance, whereas the traditional cushion shape is more fluid in appearance. Although slightly less sparkly than brilliant cut diamonds, cushion cut stones have larger facets that allow for greater white light separation and, therefore, a wider spectrum of colours in the stones as it flashes in the light. Trillion or Trilliant cut stones have been popular side stones on trilogy rings with a central princess cut stone but are now starting to rise in popularity as central stones. The three-sided stone works beautifully in rings inspired by mountainous views and, therefore, could provide you with the perfect design to pop the question with during a ski holiday or trip to the mountains. If the trillion stone is being used as a side accent stone, they will usually have fewer facets than if they are being used as the centrepiece of a solitaire. Accent trillions tend to be straight sided, whereas solitaire trillion cuts are sometimes curved or convex. Additional variations come in the form of round-cornered triangular, modified shield cuts and triangular step cuts. The trillion has a unique style and displays fantastic fire if the stone is cut with the correct depth. I hope these examples help you find a favourite! Our next blogs will run through the 4 C’s which once you’ve chosen a shape, will help you choose the right colour, cut, clarity and carat for you.